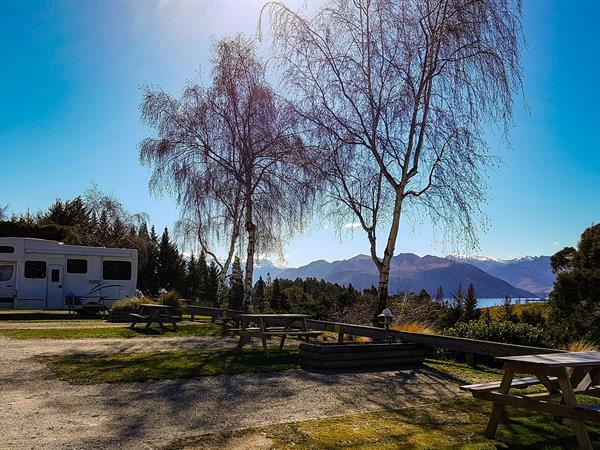 We can offer the best lake and mountain views from our powered campervan & caravan sites. The amenities block is centrally located to powered sites. The area is heated on cold days and we have baby facilities and hairdryers available. A spacious kitchen will give you plenty of space to do the cooking and to meet other guests. Enjoy the breathtaking views and the spacious, park-like grounds. All sites are either half hard-standing & half grass, or completely grassed. If you require a grass site for a powered tent site, please let us know when making your booking. If required, kitchen packs are available from the office for a refundable bond.